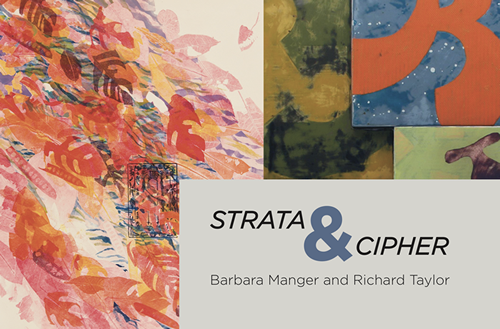 Strata & Cipher: Barbara Manger and Richard Taylor brings together two artists who work closely with color and layering, and have developed a process-oriented studio practice that transforms surprising source materials into metaphors for their experiences. Manger uses monoprinting techniques to create richly composed images that reference the textures of moving waterways, and Taylor collects found materials to inform his use of shape, color, and surface, creating sculptures reminiscent of weathered urban artifacts. The exhibition will place special emphasis on the artists’ practices – their ideation, material explorations, and craft. Viewers will likewise have the opportunity to engage creatively by spending time in our special Reading Room perusing a selection of books significant to the artists, or by making a collaborative paper collage in our Play Room – a space formerly used by the Smith family children for creative endeavors of their own.